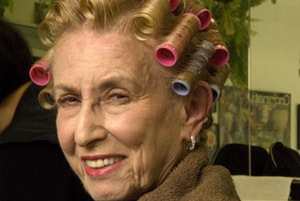 Kaye began traveling to salons throughout the United States to photograph and interview women in their seventies, eighties and nineties at their weekly appointments. Through this series, Beauty and Wisdom, she hopes to reframe the definition of female beauty and honor a group society too often overlooks. RK: When I was a musician, I met a young woman, Abi Hodes, who was the girlfriend of the drummer in my band. She photographed our band and we became friends. Over the years, she would photograph me all the time for the band, for her own interest, for my promo shots. As our friendship grew, so did our portfolios-only I was the subject. I learned so much from Abi Hodes. Not only did she teach me how to make clients feel comfortable, she taught me how beautiful the gift of a photograph was. Thanks to her, I have a collection of photographs that tell the story of my life: from the bands I was in to my birthday dinners with family and dinners with friends-candid moments caught on film, beautifully documented for me, for always. She made little handmade books and printed gorgeous black and whites, even hand-coloring some. Her photography was an extension of herself, she was never without a camera. It wasn’t her lens that caught the image, but her heart. When I transitioned away from music, it was her inspiration and love that gave me the courage to become a photographer. She is still one of my best friends, my family. I am now the one documenting the time we spend together, with her gentle guidance. RK: We met in 1988. She enabled me to feel free as a model, which in turn, taught me how to feel free as a photographer, with people and things. 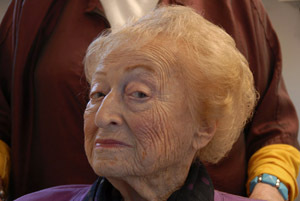 But most important, she taught me how to photograph not only with technique, but with soul and love. 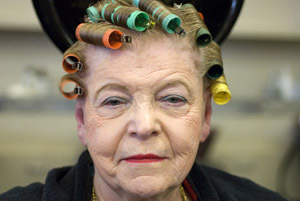 In your series Beauty & Wisdom, you photograph women over seventy at their most vulnerable-at the beauty parlor. Why did you undertake this project? RK: I started this project as a whimsical idea for a series. Then I saw the ladies and realized how much raw courage and dignity they had. They also taught me about my own vanity and the concept of aging in our society that pays homage to youth, but not to elders. The more I photographed, the more I saw how our culture keeps older women invisible. The fact that these woman allowed me to take their photograph, naturally and while they were vulnerable, says so much about them. Is this a good time or a hard time to be a woman? RK: It’s always a good time to be a woman! After many years of oppression we are working our way back to a place where the genders will honor each other for who and what they are. There will always be oppressors, but the collective consciousness of women is so great and so aware now, that it will succeed in the continuation of growth and restoration. Women should never have been disregarded…but so it was. Now it will not be so and I’m glad to be a part of the movement! I think in earlier times, ERA [Equal Rights Amendment] times, it had to be more of a retaliation, but those women opened the doors for the rest of us to do the work we’re doing now, without as much intensity and adversity. By the way, the women I am referring to are the very women I am photographing-the silent and not so silent partners anymore. Can you tell a “behind the scenes€ story? 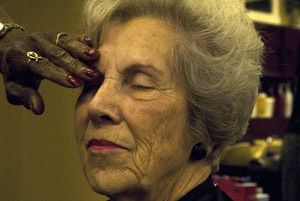 RK: Mrs. Guste lost all of her jewelry when her house was looted in New Orleans during Katrina. She was so elegant and stately (and the wife of a former Attorney General of Louisiana). She simply said, “when things go away, it’s time to let them go and give them back.€ I thought that was pretty profound. My twenty-two year old stepdaughter was with me at the time, and what she said affected both our lives. What do you as a photographer want to say to women of all ages?